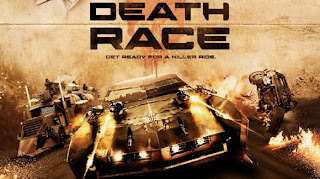 The movie Death Race has some great scenes of cars driving around a track on a prison island, firing weapons at each other, and generally doing awesome things. Many of the events in this movie are rather difficult to critique, as no details were given for most of the cars. This was a good thing as it allows audiences to enjoy the movie without the pickier people getting upset. Though, there were two particular scenes that would make even the most casual of science conscious persons cringe. Both scenes are caused by the same plot device, which is a modification to the main character's, Frankenstein's, car. Frankenstein's car is a Ford Mustang fastback which has been heavily modified. The car is armored on all sides, and has both offensive and defensive weaponry. Although we have to speculate about some of the modifications and the performance specs, the car would mass in at about 4577 kg. The bulk of the extra weight comes from a defensive shield installed on the back of the car called the Tombstone. Using images from the movie it appears to be made of 4 plates of steel, getting wider as they reach the car. Each plate is about 2 inches thick, with the narrowest plate being 27 inches wide and 40 inches tall, and each plate closer to the car being 12 inches wider than the preceding plate. This gives the shield a maximum thickness of 8 inches at the center and a mass of 1855 kg using 7.85 g/cm^3 as the density. In the movie the stated thickness of the Tombstone was 6 inches, but with the varying thickness, we'll assume they meant that as an average thickness. The suspension of the car would have to be designed to handle this kind of weight, so we can assume that the spring constant for the rear suspension must be on the order of 1250 lbs per inch. The car in this configuration performs such that all the cars on the track have approximately the same handling and acceleration profiles. At two points in the movie, the Mustang has to drop the Tombstone off of the back of the car for various plot related reasons. In and of itself this seems like a very good idea. 1855kg of steel flying back at the car behind you would certainly cramp his style, plus your car is now lighter, but in the movie there was no measurable difference in the performance of the car from before the Tombstone was dropped to after. There are two major effects that would happen from dropping this large of a mass off of a car. The first is that the rear suspension would be heavily unloaded. Since the suspension was balanced for having an extra 1855 kg hanging off the back end, removing that would cause it to very quickly unload. If we assume that the car was designed with about 4 inches of droop on the rear suspension, then dropping the rear plate would cause that to decrease to less than one inch, and it would be almost impossible for the suspension to work in turns or over dips in the road. This would first cause some bouncing when you first unloaded it, potentially causing a loss of control, and would then cause your rear end to hop around the turns. It's possible that Frank 1 and 2 were both good enough drivers to compensate for the hop, but there should have at least been the initial bounce. The second is that the car would now be lighter. Much much lighter. If you use the number that we assumed for the car's mass, dropping the Tombstone off of the back would decrease the mass from 4577 kg to a mere 2722kg! This is a 45% decrease in the total mass of the car. As we know, Force = Mass * Acceleration. Since the engine is putting out the same amount of force, if you could still put the power to the ground you would expect a 45% increase in acceleration. To put this into perspective, if we make the reasonable assumption that the car went from zero to sixty in 6 seconds as set up before dropping the Tombstone, the new zero to sixty speed would be 3.57 seconds! Even if we assume that he wouldn't be able to put the power to the ground via the wheels quite as efficiently, he should still have a marked improvement in acceleration over the other cars on the track which haven't dropped 1855kg off the mass of their car, but they pretty clearly keep up with Frank despite his last ditch emergency efforts. The movie was fun, but they could have easily shown these effects on the car without changing the story in any way, and there would have been a much lower cringe factor for the car conscious in the audience. After all, they are the most likely to watch this kind of movie. Funny,how I never thought about it.Interesting read,I have to say that.